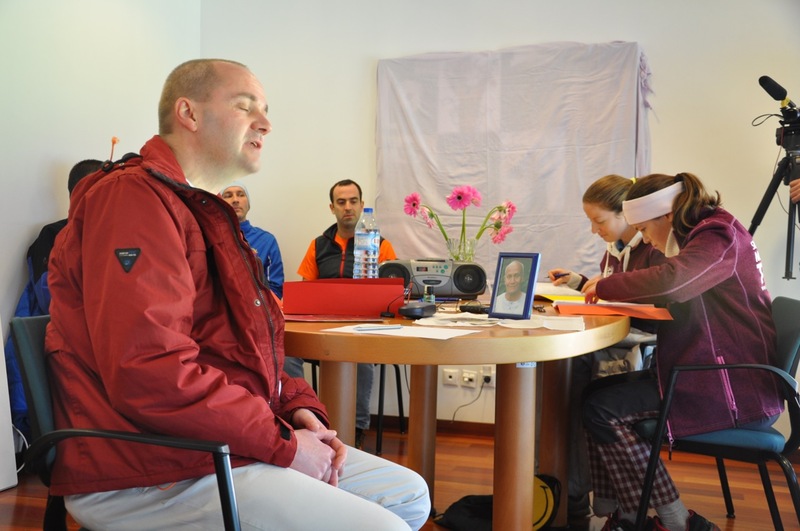 In the Sports Stadium of Leiria, the International Sri Chinmoy Centres presented another edition of IMPOSSIBILITY CHALLENGER, an event where people with special skills could transcend themselves and establish a World Record. This video shows some highlights of the event which took place on December 7, 2014. The Czech Republic has strong men! One of them showed his capacities in Leiria and astonished the audience. Radek Rosa made three personal records. First he pulled a bus filled with 17 people for 40m with only his body power in just 57.75 seconds. The total weight was 6243.5 kg. Secondly he pulled a truck filled with people with a total wight of 6155 kg for 20m in 36.26 seconds and last but not least he showed an amazing feast by pulling a huge tractor with 9.5 t for 20m in only 1 min and 29.75 seconds! Vaibhava Jewgenij Kuschnow from Austria set a new World Record by performing 10 consecutive shots hitting the target, achieving 64 points, while balancing on a slack line. The slack line was stretched between two cars in a hight of 0.93m and the target was 18 m away. But that was not enough. For his second World Record Vaibhava combined climbing and inline skating! 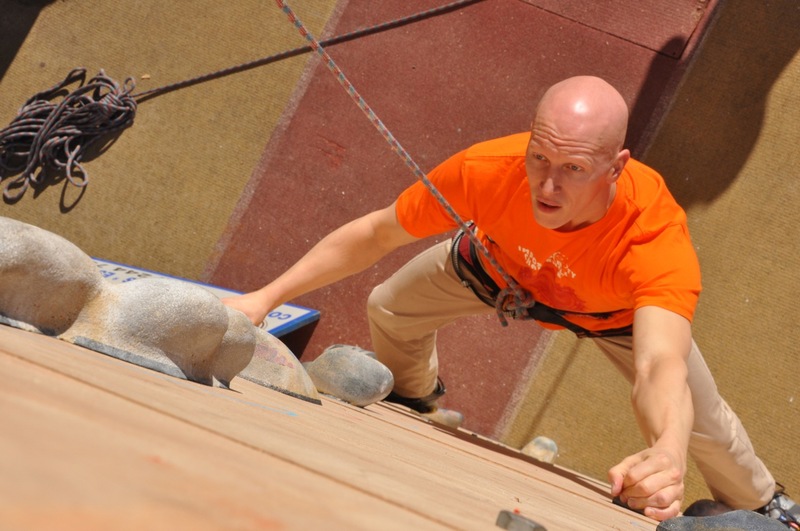 He successfully climed up a climbing wall with inline skates on 3 different UIAA routes. He was successful on his first attempts. He climbed level 5 in 41.6 seconds, level 6 in 48.4 seconds and level 7- in 55.63 seconds! In an interview on Saturday Vaibhava said that he uses positive visualisation and meditation to prepare for his records. Charuhasi Eckhard Schröder is a banker from Germany. He is also a lover of spiritual poetry and performed a stunning World Record by reciting 3148 poems (!) by memory during a period of 34 hours. All of the recited poems were written by the accomplished poet Sri Chinmoy. (I am trying to learn Sri Chinmoy’s special slection of 207 poems and am now at only 33 poems by heart, so I can really appreciate this record! – editorial note). Albert Jamie Walter is already the second generation of Impossibility Challenger participants. Already his father Ruedi participated in the event in the 1980’s. They both specialized in the tearing of telephone directories. Albert has successfully attempted a new World Record (and will also submit this record to the Guinness book of records): he was able to tear apart a huge Munich telephone directory of 1551 pages with his bare hands in only 9,38 seconds! Laughing is healthy. 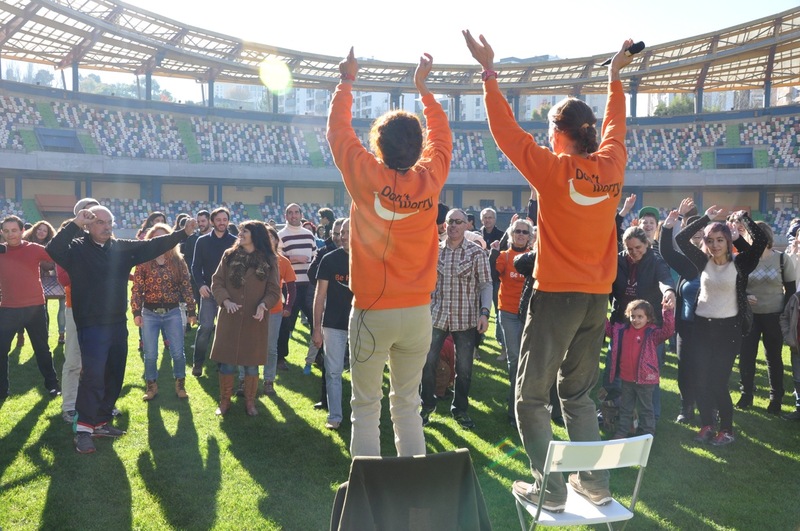 So the Escola do Riso yoga club from Coimbra tried to get together the largest Laughter Yoga Class which they achieved with 78 participants, which is a new World Record. They established a second World Record by holding the longest Laughter Yoga class for 2 hours and 53minutes with a total of 7 participants. Hugo Rito from Portugal tried to establish a new personal record in retro-running. Unfortunately the temperatures in the stadium were quite low (only 3 degree) and he had to stop after achieving a half-maration in 2:51:06 hours. The stadium of Leiria is quite impressive, with a capacity of about 29.000 seats, a height of over 30 meters and a beautiful view to the historic castle. Núcleo de Espeleologi a de Leiria made use of the height of the stadium. The group achieved 168 climbs (27m each) on ropes of 4536 m up and 4536 m down and reached a total distance of 9072 m.
Juventude Vidigalense from Portugal organized the largest 400 m relay and established a new World Record. A total of 106 tall, small, young, old, fast and slow but fully inspired runners participated with a time of 2:40:12 h.
Jorge Cardinali is a Portuguese circus artist. He wanted to test his patience in this record and had three china plates spinning on grounded sticks for a total of 4:13:34 hours simultaneously. With this he achieved a new World Record. Peace and harmony are two qualities we all would like to see spread around the globe. Nuno Figueiredo organized a drawing exhibition with 7095 A4 drawings that were exhibited in the corridors of the stadium. Over 50 schools have participated in this nationwide Portuguese event. The creativity and love the over 7000 children put to paper was moving and inspiring for all visitors! The exhibition can still be seen for the next three weeks. Carlos Manuel Viera is a fire fighter from Leiria and a very enduring cyclist. He set a new World Records cycling 15:13:55 h on rollers on top of a fire truck in the Leiria Stadium. This is a true testimonial for stamina, patience and self-transcendence! “The Record Breaker” by Brian McGinn tells the life story of Ashrita Furman, the man with the most Guinness World Records of all time. Winner of the Vimeo Audience Award at the 2013 Full Frame Documentary Film Festival and Jury Prizes at the 2012 Palm Springs International ShortsFest and the 2013 New Orleans Film Festival, The Record Breaker follows Furman as he trains to set a new record: climbing Machu Picchu on stilts. Thanks to meditation and his teacher Sri Chinmoy Ashrita is transcending himself anew. Nice Interview on Today Show Mornings with Australian Motivational Speaker Grahak Cunningham on ultra marathon and multi day running. 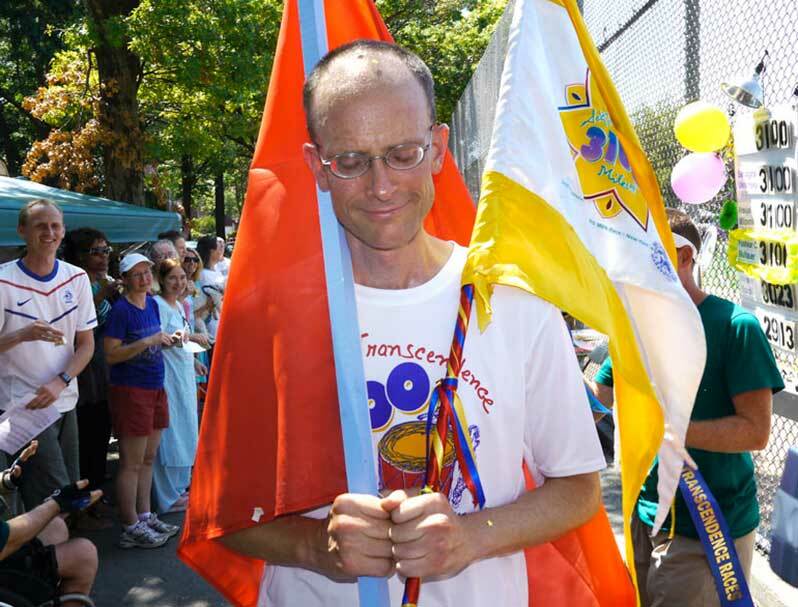 Grahak, a student of Sri Chinmoy, recently finished the 3100 mile race in Queens, NY, in first position. Congratulations! The annual Impossibility Challenger is a personal record festival of all kind of sometimes funny and sometimes extremely difficult feats. This year it was organized by the Sri Chinmoy Centre in Budapest, Hungary. Enjoy the report! Ashrita Furman, a fifty-seven year old health food store manager of New York and a team of 20 specialists, among them an engineer and carpenter, constructed the world’s largest tennis racket within ten days. Ashrita Furman’s team completed the racket today in the Borough of Queens, NY, where it was lifted upward with a crane. Furman dedicated the tennis racket to Sri Chinmoy (1931 – 2007), who would have been 81 on August 27th. A peace visionary and an avid tennis player Sri Chinmoy inspired Furman with his philosophy of self-transcendence. The old fashioned wood racket has a height of 50 feet (15.24 metre) and width of 16 feet (4.87 metre) and is an oversized reproduction of the model named after the famous American tennis legend Billie Jean King. Sri Chinmoy and Mikhail Gorbachev presented together the first World Athlete Award of the Women’s World Awards to Billie Jean King in New York City on 14 October 2006. Sri Chinmoy said about Billie Jean King: “My dear friend Billie Jean King is one of the most respected and revered female athletes of all time and life-long champion for social change and equality . … She is truly a legend.” In recognition of all Billie Jean King has done, in August 2006, the USTA National Tennis Centre, site of the US Open, was renamed in her honor. In addition the team created a tennis ball with a diameter of 4 feet (1.20 metre). Ashrita Furman is the holder of 151 current Guinness World Records, including the official record for “the most records held at the same time by an individual”. The huge sports implement ensures him a new entry into the Guinness Book of World Records. Pushkar C. Müllauer, in a brilliant attempt this year finished the 3100 mile race in Queens, NY, in 48 days, 8 hours, 22 minutes, and 16 seconds. Which is now the 17th rank all time. A personal best by 14 hours. The new Swiss record holder. He was the old one and now he is the new one. Pushkar averaged 64.121 miles per day and 103.192 km. Finishing in 4th place. As each runner approaches the finish line of the 3100 their faces radiate an almost transcendent glow of satisfaction and happiness. They shine with a pure beauty that comes not from their physical but from the divine qualities that they have drawn closer to each day and with each step that they have taken. With each new mile they moved further and further away from the predictable clutch and grasp of our material world. It may not be heaven, this place to which they have arrived, but from my perspective, as I am now so clearly caught up in the world. They, at least for a moment, have slipped beyond its reach to a realm that appears divine. The price of this kind of sacrifice is not to be measured by mortal hands but only to be praised purely by heaven’s heart. There is a prize as well, but it can only partly be seen by us. We may perceive the glimmer of their transcendent victory while they themselves bask in its full radiant glow. Of course Pushkar struggled mightily for the last few days with a catalog of injury and pain. The heat and humidity yesterday, will torment and mock him and all the others in its own perverse way. The daily cat and mouse game with obstacles big and small never disappears. For once you have climbed a mountain here it will simply be replace by another and then still another. The race offers it own unique inner joy but this is combined with an extensive legacy of suffering that can never be really avoided.There is no road map and no manual to figure out and plan routes that will safetly evade all the pitfalls of extreme weather and of course extreme life. The only coach and guide is the little voice within. That one that always speaks and offers guidance. It is with our own indifference that we do not take sufficient time and listen well. Some days ago Pushkar jettisoned the burden of expectation, and so he is unhindered by so much of what captures us and makes it difficult for most of us to even move from beyond our chairs. Today his journey will be complete in so many ways. What we see, and what all can congratulate him for, is that he has transcended himself by almost 14 hours setting a new Swiss record as well. In connection with the IMPOSSIBILITY CHALLENGER Games in Munich in 2002, Guinness Champion Ashrita Furman from Queens, NY, gave a most inspiring talk on his many adventures in regard to his records and how meditation was the key to all his success. This is a live recording with the English original sound and Jwalanta Voelkner simultaneously translates into German. Ashrita combines the facts with a lot of humor. It’s a must to watch. Length: 53:28 h Filmed and edited by Kedar Misani. The Impossibility Challenger Games are back for another edition on October 20/21 2012 in Budapest. As a warm-up you can enjoy the highlights of the 2002 event in Munich with Ashrita Furman running 1 mile with a Hulla-Hupp ring, Shamita Achenbach-König playing the cello for 11:16 h, Belachow Gima, continuously laughing for 1:40 h and much more. Filmed and edited by Kedar Misani.